Other Comments: The Curbfeelers, the popular Classic Rock and R&B band from Columbus, have been a fixture on the local music scene for forty years. They have performed throughout Ohio, New York, California and Texas, and have recently released a CD of original music called Tales From The Typewriter, which is currently receiving radio play in the U.S., Canada and France. The band, noted for its soulful vocals, tight rhythm section and hot guitar licks, was recently honored by Musician Magazine as one of the best unsigned bands in North America. The Curbfeelers also recently placed near the top of the Tenth Annual Blues Competition in River City, Ohio. 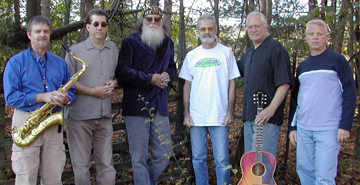 The Curbfeelers’ basic four-piece band consists of lead singer Steve Harper, two guitars, bass and drums. Saxophone may be added to create a five-piece band, and keyboard may be added to that, for a six-piece group.